This was written by a dear friend, Victor Morris, from a ministry I am involved in: Advancing Native Missions. It is worth sharing with a wider audience. Like Victor, I live close to Charlottesville. We have been deeply affected by the events in Charlottesville. One of the members of my church was on the mall during the “ugliness” doing work for one of our local TV channels. He told me the anger on both sides was palpable. I must admit I am confused by all the anger. Can we not have decent, reasonable dialogue where we can hear each other? Perhaps that train has left the station. I have a friend that is in a bi-racial marriage and she gives me clues about their reality. It makes me so sad. From Victor: I live in small town only about 10 miles from Charlottesville, VA. Like everyone else, I was horrified and angered by the events occurring in our community on August 12. I also was left with a deep concern because there is a growing focus on racial division in this country. Racism is a hot topic. And one that needs to be addressed, especially by the Christian community. According to the Scriptural account, there is actually only one human race. Biblically all humans are part of one family. We are all descended from Adam and Eve. This is plainly taught in the Scriptures. Indeed, Eve’s very name means “mother of all living” (Genesis 3:20), thus indicating her as the primal ancestor of all men. We are also all descended from Noah. During the Flood, all human beings were destroyed on the earth, leaving only Noah and his family (see Genesis 7:21-23 and 1 Peter 3:20). This is why the New Testament says that God has made all the peoples of the earth from one blood, one human stock (see Acts 17:26). To discuss the distinctions found among various groups of the human family a better word than race can be used. The Bible speaks of the nations or peoples or ethnoi, that is ethnic groups. Terms such a “people group” or “ethnic group” give a better picture of the biblical understanding of the distinctions within humanity. Where then did the various people groups of the earth come from. It is understood that everyone is descended from Adam through Noah. The various ethnic divisions may be traced to the spread of Noah’s descendants just after the Flood. This process is ethnic diversification is described in the Table of the Nations in Genesis 10. This remarkable ancient document traces the broad, general distribution of the various nations, and traces their family origins. Of course, through the millennia there has been much intermingling among the various peoples groups of the earth, so there are probably few (or possibly no) groups that are completely are of one ethnic origin. Based on the Table of the Nations, the breakdown of the ethnic groups of the earth is as follows, in very broad terms. First there are the descendants of Noah’s son Ham. The ancient Hamitic peoples included the Canaanites, Philistines, Phoenicians, ancient Egyptians and Libyans, Hittites, Amorites, Sinites, Jebusites, Cushites and Sabaeans. Modern ethnic groups that are Hamitic in origin include the various peoples of Africa, and possibly the Chinese and other Asiatic groups. Secondly, there are descendants of Shem. The ancient Semitic peoples included the Elamites, Assyrians, Hebrews, Lydians, Arameans, Yemenites, Ishmaelites. Modern ethnic groups that are Semitic in origin include the Jews, Arabs, and possibly other Middle Eastern peoples. Then there are the descendants of Noah’s son Japheth. The ancient Japthetic peoples included the Celts, Greeks, Armenians, Medes, Romans, Germanic tribes, Aryans, Scythians, Etruscans, etc. Modern Japthetic peoples are found mainly in the Indo-Europeans, including the various European peoples, Iranians and Indians. Another question that arises from this topic is where did all the different languages come from? This is an important question in regard to the nations of the earth. For the most important cultural distinctive between various peoples is their language. More than anything else, language determines the culture of a people. The Scriptures are plain that after the Flood mankind had only one language (Genesis 11:1). This unity of language caused the people to have a unity of culture, society and government. The people desired to remain unified (Genesis 11:4). For this purpose, they decided to erect a tower for occult worship and to solidify their union. However, God was not pleased with their arrogant, independent spirit (11:6). So the Lord confused their speech, and caused them to speak a number of different languages (11:7-9). As a result, the people were scattered and dispersed across the earth (Genesis 11:8). This confusion of languages is the reason for there being a multitude of languages on the earth. It does not mean that the people immediately spoke French, German, Swahili, Chinese, etc. These are modern languages. It does probably mean that God created the various primal language families that we now recognize as being the root languages of the earth. One final thought must be emphasized. The biblical portrayal of the origins of mankind teaches us that we are all one family, just one human race. 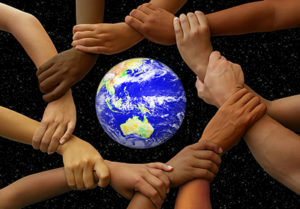 The differences between the various people groups of the earth are secondary to our unity as one human family. There is no particular “race” or ethnic group that is superior to another. We are all the creation of God, with one common blood and one common origin. God loves all nations, ethnic groups, equally. Christ died for all men, no matter the color of their skin or their national origin. Any born-again believer in Jesus Christ is a member of the family of God. We are one in His spirit, and one through His blood. It is evident from the above that there is no place for racism or racial discrimination in the Christian faith. Anyone who claims to be a Christian and has hatred for any person, much less any group of people, is by that very hatred denying the Christian faith he espouses (see 1 John 2:9-11 and 4:20). To manifest racism and racial hatred is to deny Christ and the Gospel… plain and simple. What can we know for sure? How should we pray in the midst of devastation?